One of the most useful parenting skills I have ever learnt is how to bounce difficult questions back to our two inquisitive children. The type of questions that can leave you wide open to more difficult questions. The type of questions that put you on the spot. But sometimes that approach won’t work - and this is where books like “It’s Called Dyslexia” by Jennifer Moore-Mallinos, with illustrations by Marta Fàbrega and published by the O’Brien Press come into their own. “It’s Called Dyslexia” is a beautifully illustrated children’s book which walks us through Sarah’s challenges in relation to learning to read and write when she first starts primary school. This leads to Sarah being assessed in relation to dyslexia and charts her growing confidence as she gets extra support at home and in school to develop her literacy skills. As an introduction to dyslexia for children (and indeed adults) Sarah’s story is told in a simple, elegant fashion. There is a strong emphasis on Sarah’s hurt and confusion as she struggles in school - in spite of her hard work; and a straightforward explanation of what dyslexia is and how it can be addressed. The narrative is supported by the vibrant illustrations which capture the arc of Sarah’s journey from confusion to understanding and acceptance. As such they provide plenty of opportunities for a child who is struggling with reading to tease out the story with a more able reader – with each full page illustration capturing the emotional highs and lows of Sarah’s progress. Underpinning all of this is an approach which is matter of fact and very much grounded in the reality of a child struggling to understand their place in the classroom and their difficulties with reading and writing. Sarah’s frustration and confusion is neither overplayed nor minimalised or the challenges Sarah faces to address her dyslexia. Rather the book is robustly positive that with the right support and hard work Sarah will be able to learn to read and write. 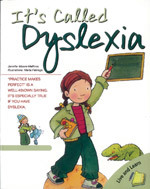 The book also has a short section for parents explaining what dyslexia is and identifies and explains a number of learning strategies that can be used at home to help a child with dyslexia. Our nine year old daughter was recently assessed and diagnosed with dyslexia and she asked us that question – “What is dyslexia?” - it’s not the type of question a parent wants too have to answer – you have your own questions – Why my child? Did we do something wrong? What will the future hold for them? But “It’s called Dyslexia” was a real help in giving a clear, understandable explanation of both what the condition is and how it impacts on both a child’s emotional life and how they can start to progress through the challenges it poses.